Underground Racing has a habit of feeding lots of power to Lamborghini supercars, and the Huracan platform has been more successful for them than ever. The smallest Lambo has a V10 with gobs of power from the factory, but for the huge speed Underground wants out of its cars, it’s not nearly enough. The red car shown here allegedly has 3500 horsepower on board, and it’s ridiculously fast. Where the company says they’ve accomplished everything they needed to in half-mile top speed competitions—setting a 259 mph half is pretty impressive, I will say—and roll racing, they’ve moved on to proper quarter mile drag racing. 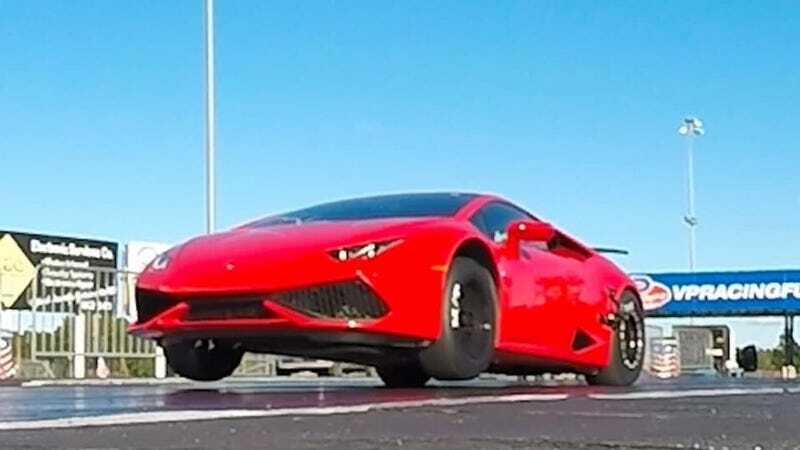 Any excuse for a Lamborghini Huracan to be fitted with Mickey Thompson drag radials is a good enough excuse to sit back and watch, as far as I’m concerned. And it managed to go straight for the whole run without wildly veering to the left. This weekend the little red Lambo ran a 7.9 second ET, and picked its wheels up off the deck in the process. That’s utterly and totally badass. You can watch the full sub-8-second run in the video below from the 10:14 mark. It’s bonkerballs.